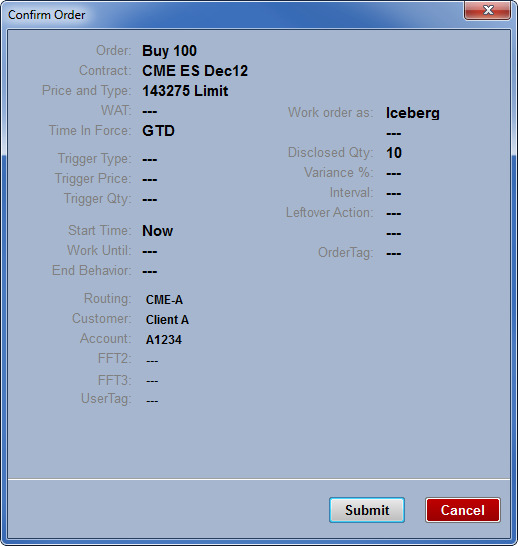 X_TRADER has controls in place that let you confirm your order prior to submitting it. On the Orders tab on the Properties menu, you can choose to set the Confirm checkbox on every Order Pane. Setting the property means, the Confirm checkbox below is automatically pre-checked on the Order Pane before you send an order. You can also choose to manually check the Confirm checkbox if the property is not set. The Change the button label property adds the word Apply in front of the regular button name each time you submit an order. Click the Apply button to confirm the order. The Display confirmation box property shows the Confirm Order window each time you submit an order. Click Submit to confirm the order.